How short the daylight hours have now become. How gray the skies, how barren seem the trees. A damp and chilling wind has gripped my mind and made me gloomy, too. As babes are hope, and saviors of the world, as miracles abound in common things. Rejoice! And join in the gladness of the season. Yule is winter solstice, the longest night of the year. It usually occurs around December 21st or 22nd. It is the time when the days begin to lengthen again. The day is also called “Midwinter” and “Mother Night” by some Neo-Pagans. The day falls near Christmas and the Jewish holiday of Hanukah, when candles are lit on the new moon closest to the winter solstice. 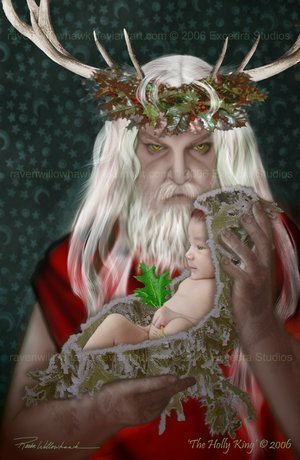 Many Neo-Pagans celebrate Yule as the birth of the “Child of Promise” or “Sun Child” from the dark womb of the Goddess, a child who will defeat the powers of darkness in the spring and then be killed in the autumn, only to be reborn again the following winter. The resemblance to the Christmas myth is unavoidable. The primary difference is that, while Christians see this as a historical even that occurred one time centuries ago, Neo-Pagans see it as a cosmic event which occurs annually in nature and more or less frequently in the human soul. In both traditions, the winter solstice is an ambivalent time, the darkest time of the year, which simultaneously is the beginning of the return of light, a reminder that “it is always darkest before the dawn”. There is no universal outline for the Wheel of the Year. Every version differs in the details of the Mythos and which events are assigned to which point on the Wheel. According to one version, at Yule, the darkness, in the form of the Holly King, still reigns, but it begins its decline, as the light begins its ascendancy. The Goddess returns from the Underworld. She travails and bears her Son, the Sun Child. The Goddess’ ascent from the tomb mirrors the coming forth of the Sun Child from the darkness of her womb. The Goddess then takes on her Crone (old woman) aspect.